Owning unusual pets is not so strange as you may think, reptiles offer us a glimpse into the past. Many reptiles remain unchanged from their original prehistoric times, Keeping reptiles as pets is like having your own mini Jurassic Park in your own home. They provide excellent opportunities for study and are fascinating creatures to observe. If you lead a busy life style and have limited time to care for a 'normal' pet such as a dog or cat, which require exercise and grooming, a reptile that lives in its own environment and does not have to be petted may be the pet for you. Reptiles are hypo-allergenic, if you suffer from an allergy with fur or feathered animals you will not get an allergic reaction from coming into contact with reptiles. Unlike dogs and cats reptiles require no petting and very little handling, in fact they prefer little contact and benefit by being left to their own company. A glass tank of adequate size and appropriate heating is ideal, being cold blooded creatures they do require their owners to provide heating, heat pads that provide heat in the tank where needed suffice. Some reptiles may require U.V lighting. If you are considering a reptile as a pet it is wise to gain adequate knowledge to be able to provide the right care for your chosen pet. 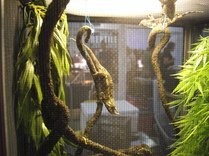 Ample literature is available covering every aspect of care and feeding, with a little studying you will soon become an expert in you own field of reptile care. When choosing suitable unusual pets, remember that some are more suitable than others. It is important to know the specific food and living conditions, how big it will grow, how long it will live. A selection of suitable unusual pets to consider include corn snakes, milk snakes king-snakes, ball pythons, leopard geckos, bearded dragons and blue-tongued skinks. I am lucky enough to live in a part of the world that is abundent in Geckos and Skinks,infact 3 Geckos moved into our home and have taken up residence behind a picture frame, another lives at the the back of my computer desk. I guess you could call him a 'Techno Gecko' it is not unusual to look up from my key board to see him studying me. Some reptiles that are not recommended as pets for the newcomer these make unsuitable pets include large monitors, large constrictors (such as anacondas and giant pythons), red-eared sliders, green iguanas, crocodilians and venomous reptiles. Buy only from reputable dealers to ensure you are purchasing the correct species. Altogether reptiles are one of the easiest pets to care for requiring less attention than cats and dogs. .
Much of the above advice applies to keeping insects as pets , providing a suitable environment, which mimics its natural habitat and correct feeding are essential. These creatures require no handling and provide excellent opportunities for study. Suitable insects as pets include, Tarantulas, acceptable for a beginner, providing you select the correct species, suitable species include Chilean rose, Mexican Red-leg, or Costa-Rican Zebra. These species are reasonably docile compared to some other tarantulas. Stick insects, Hissing Cockroaches are even more docile and are fascinating to observe as they go about their daily lives. Insects and spiders are a bit of a specialist pet to keep, you really need to have a deep interest in this type of creature to gain the most pleasure from them.